Source: Admiral Markets MT5 Supreme Edition - AUDJPY, 5 minute chart - Data range: 2 January - 3 January 2019 - Performed on 3 January at 11:24 GMT - Please Note: Past performance is not a reliable indicator of future results, or future performance. 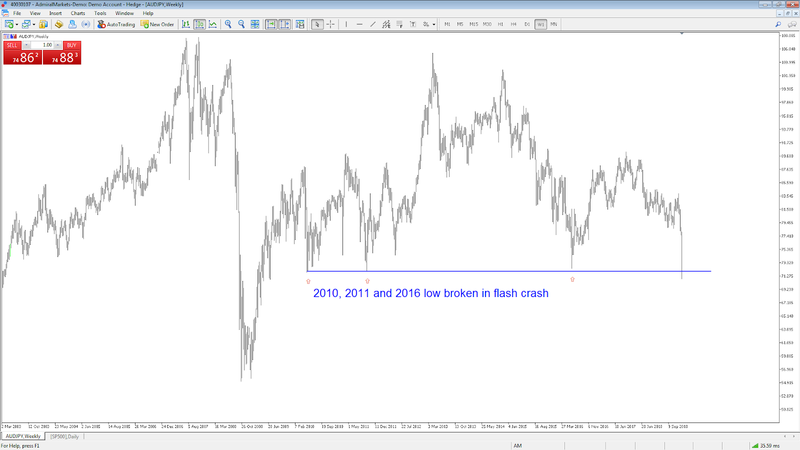 Source: Admiral Markets MT5 Supreme Edition - AUDJPY, Weekly chart - Data range: 2 March 2003 - 3 January 2019 - Performed on 3 January at 11:25 GMT - Please Note: Past performance is not a reliable indicator of future results, or future performance. 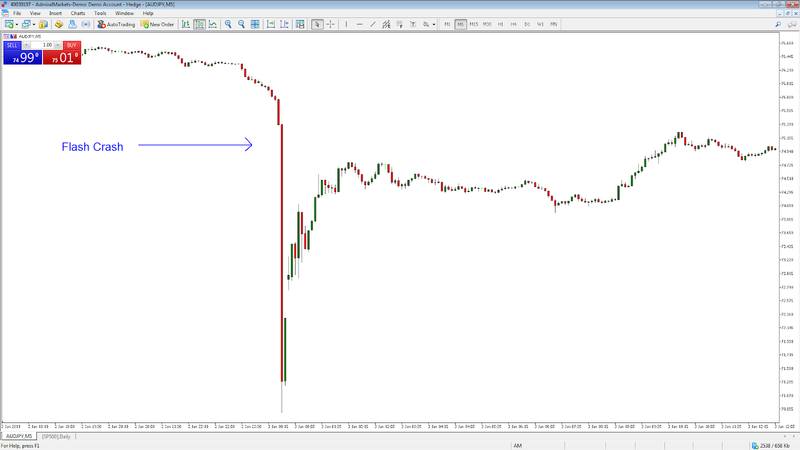 What caused JPY's flash crash? While there is no single reason that caused mass panic in the market, there are some clues as to why the moved happened. Apple's CEO, Tim Cook, gave a rare warning on the company's future revenue. The iPhone maker cut its revenue forecast - marking its first downgrade in nearly 12 years. The reason given was sales problems in the Greater China region, which accounts for almost 20% of the company's revenue. The market already had some concerns regarding Chinese economic growth and the impact of US president Donald Trump's trade tariffs. However, with the CEO of the world's largest consumer company saying they "did not foresee the magnitude of the economic deceleration in Greater China", investors rushed to safe-haven currency plays like the Japanese Yen, while simultaneously dumping Apple stock in premarket trading.